A new breed of editor has arrived. It fills the gaping void between basic text applications (Notepad, TextEdit, gedit, etc.) and full Integrated Development Environments (VisualStudio, Eclipse, NetBeans etc.) Simpler applications lack basic development requirements such as multiple documents, line numbering and code coloring. IDEs tend to be monolithic applications which cater for a specific language, framework or platform. Cross-platform and work on Windows, Mac and Linux. Your preferences and settings should be available regardless of which OS you’re using. Highly customizable with cross-platform plugins and themes. Fast and stable. Launching should never be a once-a-day dread like some IDEs. Immediately usable without a steep learning curve or having to remember numerous keyboard shortcuts. Sorry Vim and Emacs fans — console-based applications have been excluded — but you were never going to consider an alternative editor anyway! I’ve also rejected browser-based editors such as Cloud9 and CodeEnvy because they tend to be a little too web-oriented and cannot be used offline. Finally, it’s not possible to cover every editor matching these criteria but let us know if there are any you’d like considered for a future review (such as the new Lime Text project). Developers spend many, many hours using their chosen editor. It’s a subjective decision and, once you have the perfect configuration, it’s difficult to switch to another application. That said, SitePoint Smack-downs are not “use whatever suits you, buddy” reviews; the writer (me in this case) will make recommendations based on their own experience, requirements and biases. You’ll agree with some points and disagree with others; that’s great — add your comments so we can help others make an informed choice. We’ll also endeavour to keep these articles up-to-date, with new information added as necessary. First, we have Sublime Text. The C++ and Python application was written by Jon Skinner and has attracted more than 2.5 million users since its launch in 2008. Reviews have been mostly positive and, while it wasn’t the first sophisticated text editor, it set the bar for those which followed. Unlike the other contenders, Sublime Text is a commercial product costing $70 per user (you can have as many installations as you like). You can evaluate the product for as long as you need; it’ll nag you to purchase a license every so often. $70 is considerably more expensive than free but divide it by the number of hours usage and the cost becomes negligible. Sublime Text is the most mature application and the only one not in a pre-release phase (although I was using version 3 beta for the purpose of this review). It therefore has a slight advantage but all the contenders are usable today. At the time of writing, Atom is reasonably easy to install on Mac and has a built-in updater. The Windows and Linux versions are a little behind with the latter requiring source build instructions. The project is developed in sprints and a new version is available every 2-3 weeks. There’s no auto-update yet, but the editor will warn you when a new version of the application and plugins are available. Light Table is a late contender. The crowd-funded Kickstarter campaign raised more than $300,000 for Chris Granger & Robert Attorri to develop the open source editor in ClojureScript with a Node-webkit wrapper. Light Table describes itself as “the next generation code editor”. It aims to provide a flexible interface, real-time evaluation, live visualization and documentation where you need it. The editor is still in an early phase of development and language support is more limited than the other contenders. 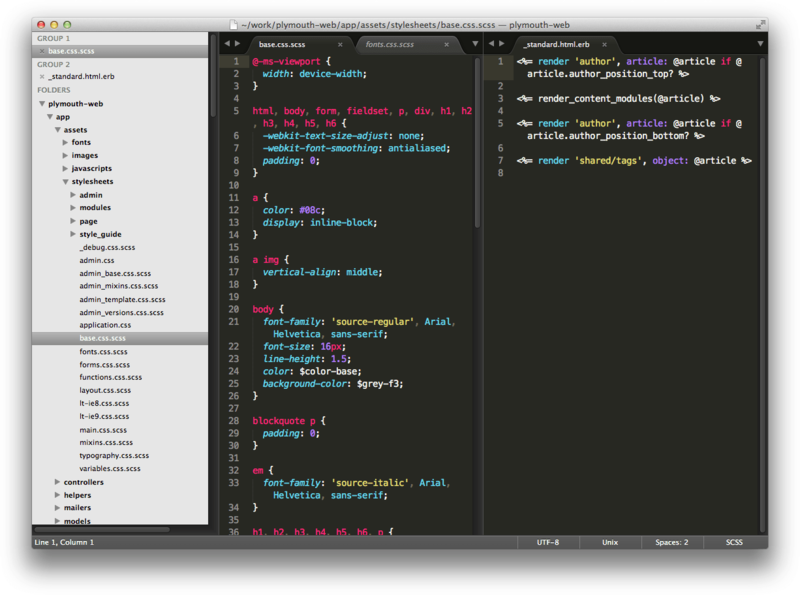 Sublime Text 3 beta was installed on all platforms and used for six months. Atom 0.123 (and below) was installed on Mac only and used for four months. Light Table 0.6.7 was installed on all platforms and used for six weeks. It’s a late contender so it hasn’t received as much testing. Text editors don’t necessarily need to be pretty, but you’ll be staring at it all day so it helps if the interface is clean and usable, and also that it stays out of the way during marathon coding sessions. Color coding and customizable themes are essential and, while Sublime Text offers the most options, the other editors have a good range which can be adjusted to your liking. It’s difficult to choose a favorite because they all look similar. 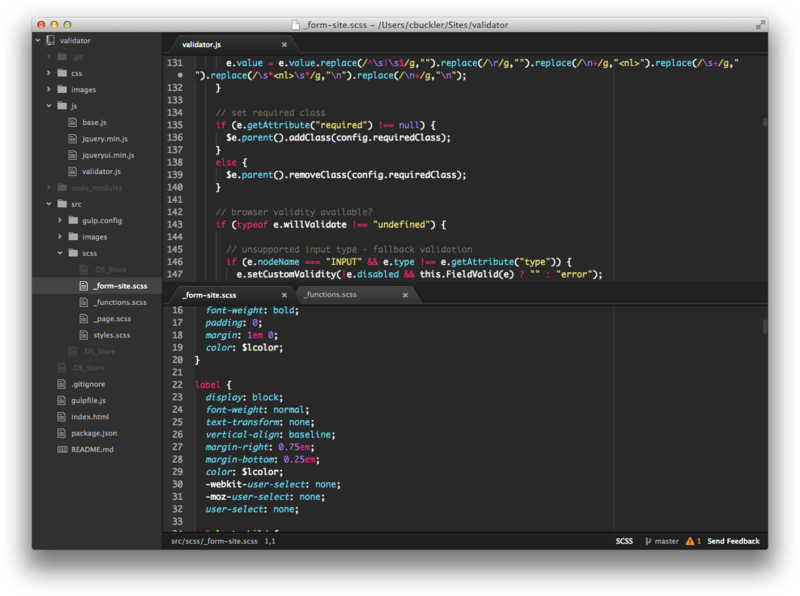 In addition, I prefer Sublime Text’s default Monokai theme, but the others offer similar variations. The winner: Brackets — but only just. It provides the most consistent cross-platform experience and looks great. It’s let down by font rendering, which doesn’t seem as smooth as other editors, but some tweaking can solve that issue. Atom is a close second. It has a slight edge on Sublime Text which looks somewhat out of place on Windows. Finally, Light Table has little interface to judge — but that could be an asset. All the contenders can edit source files regardless of syntax. However, Sublime Text wins the category because it offers color coding and assistance for dozens of popular and arcane languages. The ideal editor will make you productive on day one and allow you to discover features over time. Brackets takes an easy win; most options are available from the menu and interface without having to edit configuration files (although they’re still available). Sublime Text is packed full of features but finding, configuring and using them is another matter. Atom is slightly better in that respect but still has a relatively steep learning curve compared to Brackets. On the other hand, Light Table hides its power, and you’ll need to read documents and watch videos to learn basic operations such as enabling word-wrap or changing indentation settings. No contest: Sublime Text is far faster than the other editors and I don’t recall a single crash or loss of work. Light Table is also quick. It managed to open large 25Mb file faster than Sublime Text, although editing was more sluggish. Atom is noticeably slower. It’s usable although opening large files isn’t possible — the editor currently has a 2Mb limit. How good is the editor before you start adding plugins? The winner is Sublime Text: it offers a wide range of features out of the box. Perhaps this is inevitable for a commercial product. Other contenders take a more minimal approach, with a basic editor supplemented by plugins offering advanced options should you require them. Even auto-complete is a plugin for Atom, and Brackets doesn’t yet have a split view. On balance, I prefer this philosophy but Sublime Text manages to remain nimble and light despite the extra functionality. Live Preview: launch a page in a browser and watch changes in real-time as you edit. CSS Quick Edit: hit Ctrl/Cmd+E when editing HTML to reveal and edit the CSS styles associated with that element. Code completion, a color picker, image previewer and animation timing bezier curve editor. Brackets has less emphasis on server-side languages but basic syntax support is available. Light Table follows with workspaces, browser preview panes, live editing, code evaluation, auto-complete and documentation. Surprisingly, it’s not possible to view image files despite the editor having a browser base. Atom and Sublime Text are more general-purpose editors. They may be less web-oriented but have further options. 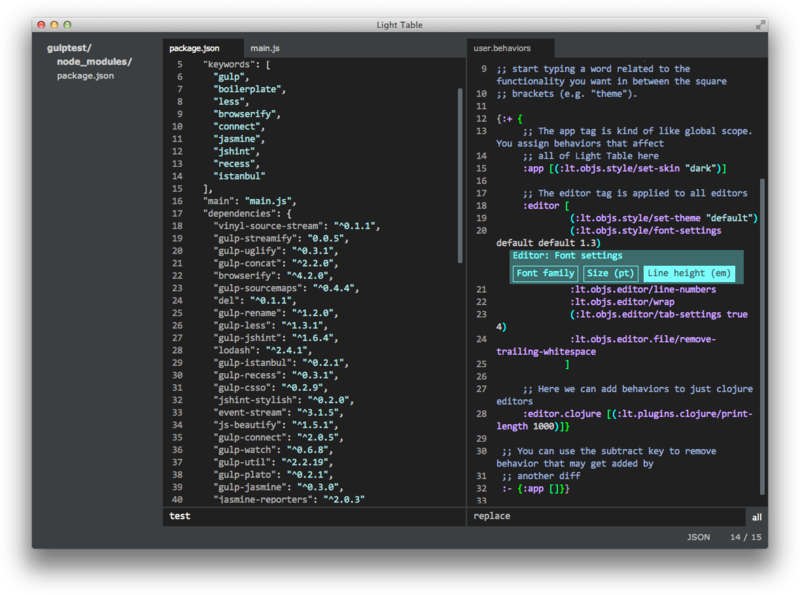 Sublime Text seems the obvious winner — the editor has almost 2,500 extensions. That said, quality is variable and package control is more difficult than the competition. Sublime Text’s API documentation is minimal, it’s not possible for plugins to interact with the whole interface and Python knowledge is required. Light Table has a small number of plugins and the API is not complete at the time of writing. This category is more difficult to assess, since all the editors are designed to be highly customizable. After much deliberation, the winner is Atom. It has similar configuration files to Sublime Text, but many options can be discovered within the interface. Documentation is better and the editor’s source is available should you require deeper changes or plugin development. 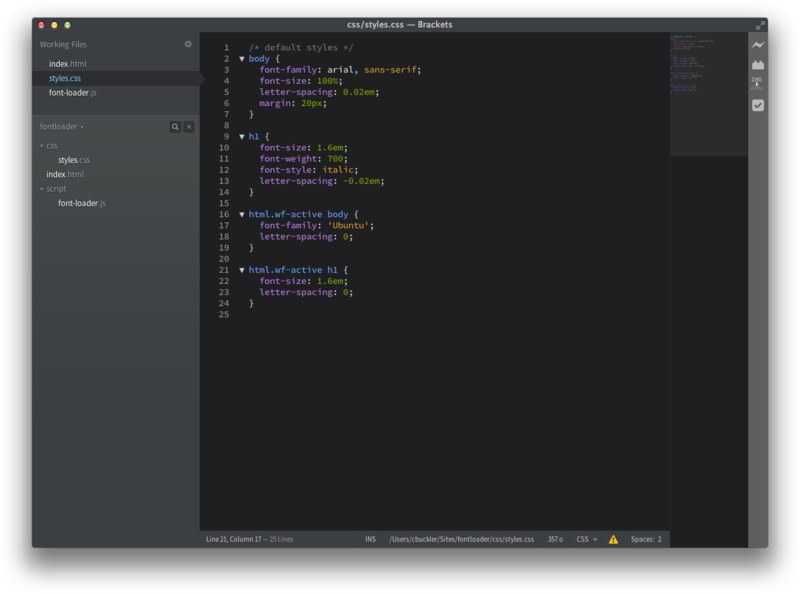 Brackets has plenty of options and is also open source, but it’s not as configurable as Atom and Sublime Text. Light Table’s level of customization is good, but it’s more complex, even with comprehensive auto-completion and assistance. Sublime Text’s pace of development has slowed although that’s understandable given its maturity. Its future as a commercial product is less certain given that Atom — the winner in this category — is backed by GitHub who are giving it away for free. The editor will be hard to beat once the final version is released on all platforms. Brackets also has a positive future: it’s backed by Adobe and has dozens of contributers. The number of features and plugins has grown significantly during the past few months. It’s too early to predict Light Table’s future. The editor is promising and works well on less powerful hardware, but it’s taking a fairly radical path and I’m not convinced it will gain mass appeal. The rounds have been surprisingly close. If we presume round 7 was a three-way tie, Atom won three with Brackets and Sublime Text on four each. All the editors are good but, if I had to choose a single editor today, it would be an easy decision. Sublime Text remains the editor to beat despite the monetary cost. The editor is fast, stable and has a ridiculous number of features and plugins. The downside: features can be difficult to discover and you’ll have a nagging doubt you’re not using the editor to its full advantage. Brackets did well. It’s evolving rapidly, has web development features you won’t find elsewhere and feels polished on all platforms. Speed and stability can mar the experience but it’s a viable option for front-end developers with a reasonably powerful machine. Although Light Table didn’t win any rounds, it’s an interesting project with a radical approach. It’s lightweight and fast on modest hardware but you’ll need to invest time learning how to use and configure the editor. Few of us have the patience but I suspect it could gain an underground Vim-like quasi-religious following. The editors are free so you can install and use them interchangeably. I usually reach for Atom when I’m doing project work on the Mac. Brackets is my preferred choice on the PC for client-side projects or markdown files (there’s a great preview plugin). Finally, I use Light Table for quick viewing and editing on all OSs. Ultimately, it’s congratulations to Sublime Text, which remains the editor of choice! Do you agree with Craig’s choice? Please leave your comments, and let us know which products you’d like compared (not just text editors) in future SitePoint Smack-downs.